During St Martin’s HOTS in August we had the chance to use our umbrellas. They were very useful as we used them to shelter us from the rain and from the sun! The weather was just a mixture but that it didn’t stop us to pray for passers-by. A few weeks ago I visited the Harnhill Centre of Christian healing. The model they use to help people to overcome hurts and brokenness in their lives is a model called the Circle of God’s love. They explain to all who go there that as we position ourselves within the circle of God’s love, we see God continually ministering to us with his forgiveness, healing, redemption and renewal. We find a remarkable statement in this verse: ‘You are precious and honoured in my sight and I love you’. These three truths of God’s attitude towards us – precious, honoured and loved underpin the giving of Jesus in exchange for us. That’s why we have the motivation to go out and pray for folks we don’t know but who are known by God who loves them and sees them as precious and honoured people. A young man with a brain injury as a result of a fall nine years ago came for prayer. He was with some friends heading to a party when he saw folks sitting on the chairs and his curiosity led him to be prayed for. He received the ‘Why Jesus’ booklet and the team members prayed he will meet Jesus as he goes to the party making it a special celebration. 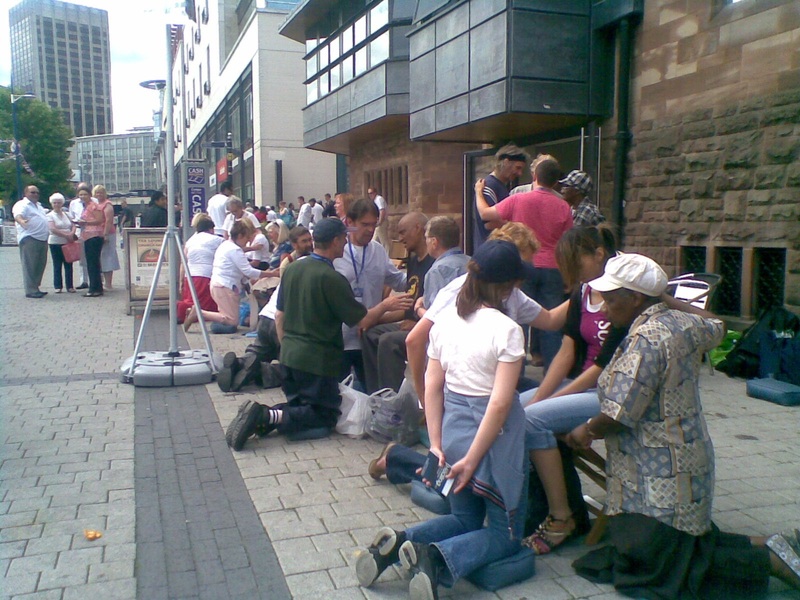 A solicitor of Asian origin stopped to talk and the team were able to witness the love of Christ to him. He has a love for people in his country especially for the poor and destitute. He has respect for Christianity and has been exploring the Christian faith. A lady came for prayer who shared her many problems with the team. She has been through divorce with 5 children and one of them is in hospital with an undiagnosed illness. She is a Christian but she struggles to maintain her faith. A lady suffering from an infection in her eyebrow and eyelashes came for prayer for herself and for her friend who had just been diagnosed with breast cancer. A man who had a stroke 30 years ago had depression since then and feel unable to make decisions. A lady was diagnosed with breast cancer 3 years ago asked prayers for healing to remain – the team also prayed for healing of emotions , memories and for her to know Jesus and receive the Holy Spirit. These were the requests from people who are precious, honoured and loved by God who gave them Jesus to live and die for them. A lady who had glaucoma came for prayer. She thinks is getting worse and is worried about going blind. The team prayed and told the condition to leave in Jesus’ name. She also mentioned that she had an operation for cataracts and that the anaesthetic machine had failed. She felt everything and was in horrendous pain. The team prayed against shock and trauma. She said she felt much better afterwards. The team asked if she could read and she said she needed magnifying glasses. One of the team members gave her a bible to read and this is what the team member wrote: ‘She read out a passage from my Bible- tiny print’ Praise God’. Because I know this lady in question well I phoned her to know how she is getting on. She said she felt much better after she received prayers. She went to see her specialist and he said her condition has not deteriorated and does not need to see her until January. She was a bit surprised, shocked, concerned and not so sure what to think as he usually sees her every other month! Hi, what a wonderful ministry you folks have. I an an Anglican priest (charismatic) in the “colonies” and have written several on the healing ministry (check Amazon) and right now I am doing a book on the varieties of the public prayer station. My group did on back in the 1980s, and that was followed by YWAM in 1992. The HOTS model is wonderful and I am doing a chapter on it for my new book. Could you give me permission to use the picture on your page, or others.